I am a self-taught artist and I enjoy painting florals and landscapes in oils, palette knife painting in acrylics and digital painting on my iPad. I live in the beautiful Kawartha Lakes region of Ontario, Canada with my husband John and our two black cats Boo and Hickory. I’m pleased to be participating in the Six Degrees of Freedom show at the Etobicoke Civic Centre Art Gallery from August 26 to September 20. I’ve been busy creating some new work – I always like to have some new paintings for a show. Having a deadline also helps with motivation! The opening reception is on Sunday, August 26 at 2pm and everyone is welcome. This entry was posted in Uncategorized on August 13, 2018 by bl.stonehouse@gmail.com. Doesn’t that sound awesome? 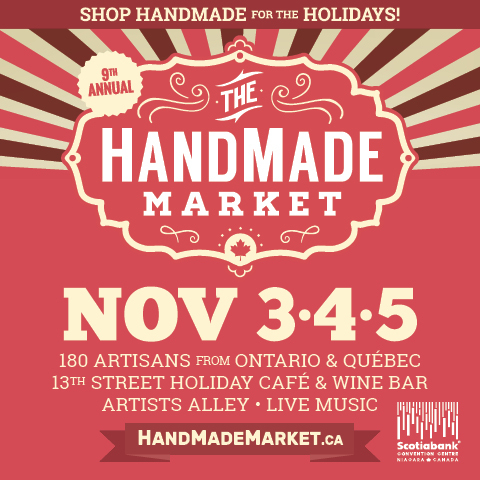 I’m excited to be part of the Holiday Handmade Market in Niagara Falls November 3 – 5. Get a jump on your holiday gift giving at Niagara’s LARGEST indoor holiday handmade market featuring 1000’s of one-of-a-kind handcrafted gifts and artisan made products all under one roof. Featuring 180 Artisans from Ontario and Quebec, the 13th Street Holiday Café and Wine Bar, live painting with local artist-in-residence, live music presented by Long and McQuade, and Artists Alley where I’ll be with some new original oil paintings and limited edition prints. Admission is $10 (Under 16 free). This entry was posted in Art and tagged art show, Holiday Handmade Market, Holiday shopping, Niagara Falls, Scotiabank Convention Centre, shop, sip & savour on October 15, 2017 by bl.stonehouse@gmail.com. 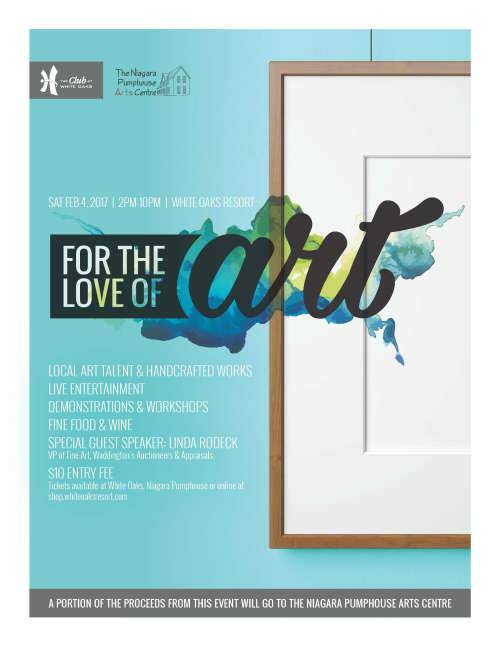 I am pleased to have been selected for the inaugural “For the Love of Art” Juried Art Show at White Oaks Resort in Niagara-on-the-Lake, in partnership with the Niagara Pumphouse Arts Centre on February 4, 2017 from 2pm – 10pm . And better yet, I get to share a booth with my father, Bruce Stonehouse! The exhibition will feature original hand-crafted works, live entertainment, fine food & wine, demonstrations and workshops along with a special guest speaker. 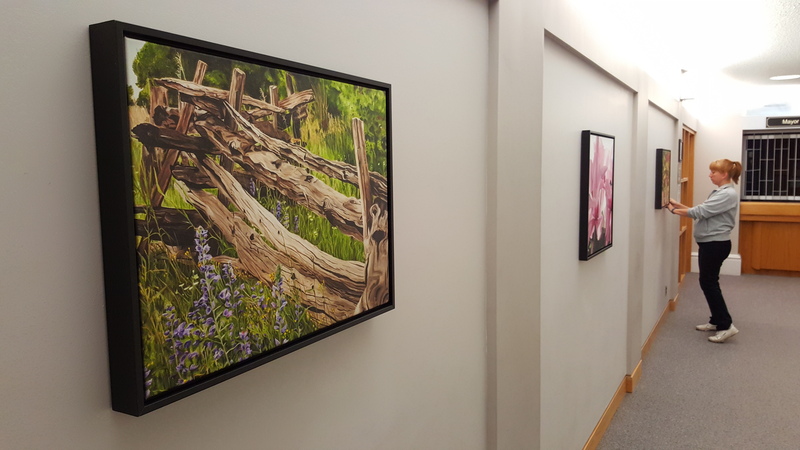 Linda Rodeck, VP of Fine Art at Waddington’s Auctioneers & Appraisals will be discussing The Do’s and Don’ts of Building an Art Collection at 4:00 p.m. in The Idea Loft at White Oaks Resort. Admission to the event is $10 and tickets can be purchased in advance online. This entry was posted in Art and tagged art, For the Love of Art, juried art show, Niagara on the Lake, Niagara Pumphouse Arts Centre, paintings, White Oaks Resort on December 11, 2016 by bl.stonehouse@gmail.com. My final art show of the year is Six Degrees of Freedom at the Etobicoke Civic Centre Art Gallery and it begins this weekend. The exhibition features exciting and dramatic original works by six different artists in acrylics, oils and watercolours. I’m really excited to be a part of this group exhibition and pleased to be able to exhibit with my father again. My Dad and I had exhibitions in Thunder Bay and Lindsay in 2011 so it’s been a while since we’ve had our paintings displayed together. The show runs from August 28 to September 27, 2016 with the opening reception on Sunday, August 28th from 2-4pm. Participating artists are Biljana Baker, Gail Backus, Nancy Newman, Doreen Renner, Bruce Stonehouse (my father) and me! 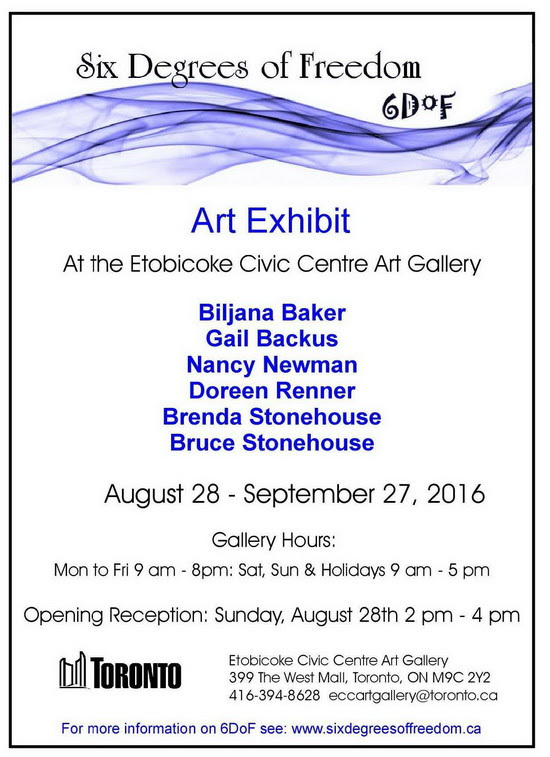 This entry was posted in Art and tagged art exhibit, art gallery, art show, Etobicoke Civic Centre Art Gallery, gallery, oil painting, paintings, Six Degrees of Freedom on August 27, 2016 by bl.stonehouse@gmail.com. Buckhorn Fine Art Festival this weekend! The Buckhorn Fine Art Festival is this weekend – August 12, 13 & 14 – and I can’t believe it’s mid-August already. It has been a busy summer and it always goes by way too quickly! This is my fourth year at this show and it’s always enjoyable. There are so many talented artists with incredible work at this show and the volunteers are great – always helpful and friendly. The opening night Garden Party on Friday from 7-9pm is my favourite. It’s a real party atmosphere with live music, hors d’oeuvres and cash bar. Garden Party ticket holders get admission throughout the weekend as well. The show continues Saturday and Sunday from 10am – 5pm. If you are in the area I would encourage you to drop by – it’s worth it! This entry was posted in Art and tagged art festival, art show, Buckhorn Fine Art Festival, oil painting, painting on August 11, 2016 by bl.stonehouse@gmail.com. It has been a busy spring in the studio and our gardens and now we’re busy preparing for upcoming art shows! I’m excited to be at Art by the Lighthouse in Niagara on the Lake on July 30 & 31 (details below) for the first time. 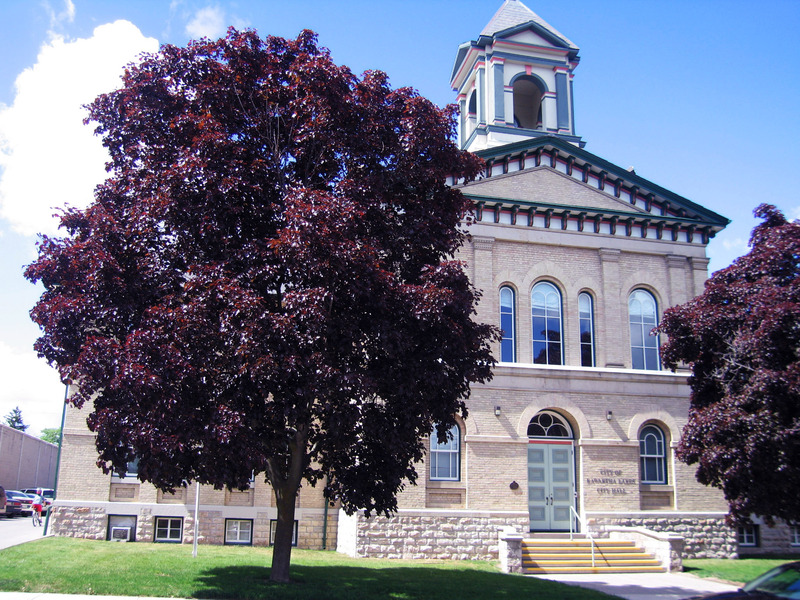 It’s such a lovely community and the Niagara Pumphouse Arts Centre is right on the water. That weekend also features the TD Niagara Jazz Festival and Canal Days in Port Colborne so there is a lot of entertainment to take in. My final show for 2016 is Six Degrees of Freedom in Etobicoke at the end of August which also features my father, Bruce Stonehouse. We had father/daughter shows in both Thunder Bay and Lindsay in 2011 and it’s great to have the opportunity to exhibit together again – this time with four other amazing artists! This entry was posted in Art and tagged art, Art by the Lighthouse, art show, Buckhorn Fine Art Festival, exhibition, oil painting, painting, Six Degrees of Freedom on July 4, 2016 by bl.stonehouse@gmail.com. 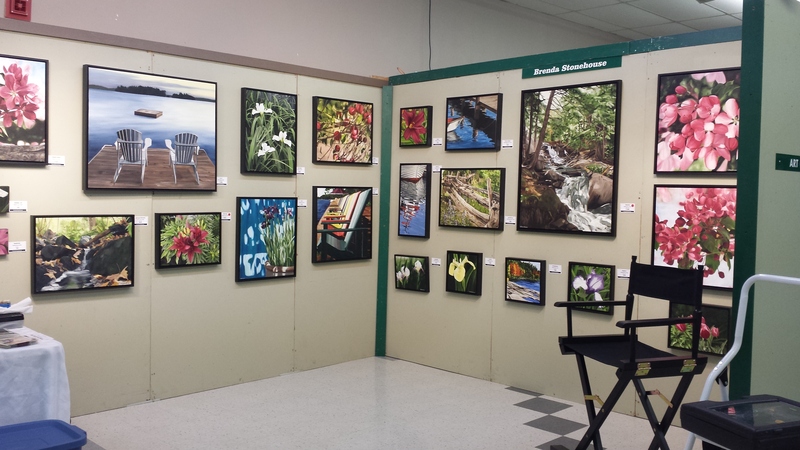 I will be at the Peterborough Garden Show with my paintings on April 8, 9 and 10 at the Evinrude Centre, 911 Monaghan Rd. – come by and say hi! This is the first time I’ve participated in this show and I’m really looking forward to it. It is put on by the Peterborough Horticultural Society and the Peterborough and Area Master Gardeners. 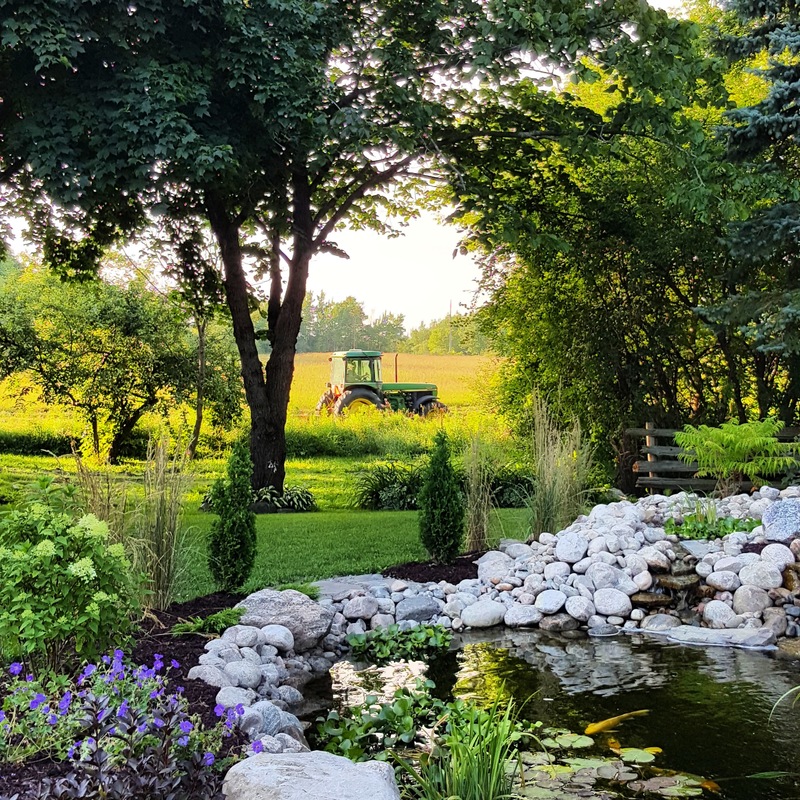 Proceeds from the show are used for scholarships to students studying horticultural related studies, supporting Master Gardeners in training and grants to Community Gardens. There are over 100 vendors and exhibitors – gardeners, landscapers, growers, teachers, designers, non-profit organizations and artists. There will be garden displays and demonstrations, and garden experts speaking throughout the weekend. I love this show because it means spring is here! This time of year I get itching to get outside into the garden and the show is full of new ideas and inspiration. I wonder what I will find for our oasis this year. Show hours are Friday April 8 – 5pm to 9pm; Saturday April 9 – 10am – 5pm; and Sunday April 10 – 10am – 4pm. Admission is $8 for adults or $12 for a weekend pass. Children under 12 are free. This entry was posted in Art and tagged art, garden, paintings, peterborough, Peterborough Garden Show, spring on April 3, 2016 by bl.stonehouse@gmail.com. 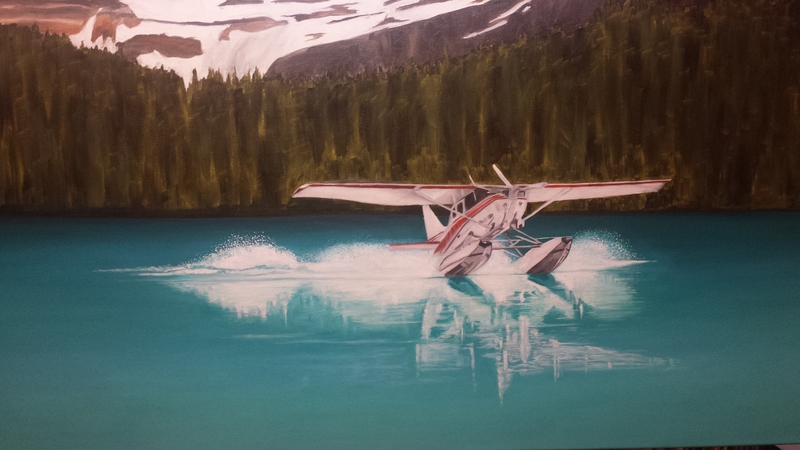 It’s a crisp, clear day in Western Canada when a float plane makes a bit of a hard landing (a ‘late flare’) into a crystal clear glacial lake deep in the wilderness. This painting, a commission for a pilot (who also happens to be my favourite..and only… brother-in-law), was a challenge due to it’s size and the subject matter since it’s quite different from what I usually paint. I’m very pleased with the result and most importantly the pilot is as well! 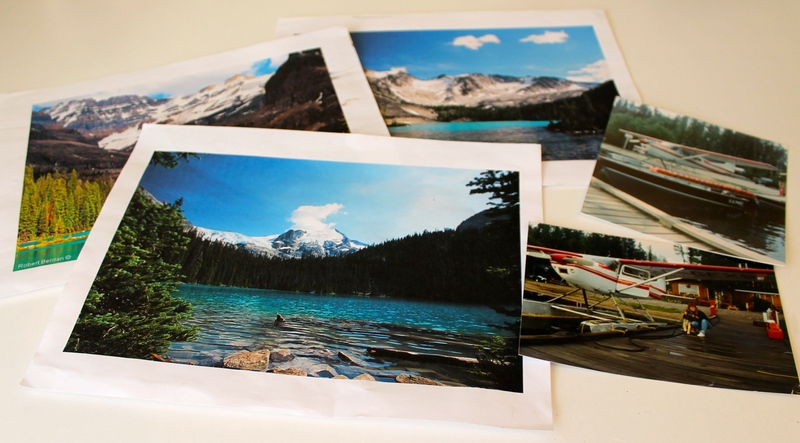 I started the process with a number of photos that he provided of mountains, trees, lakes and a specific airplane. 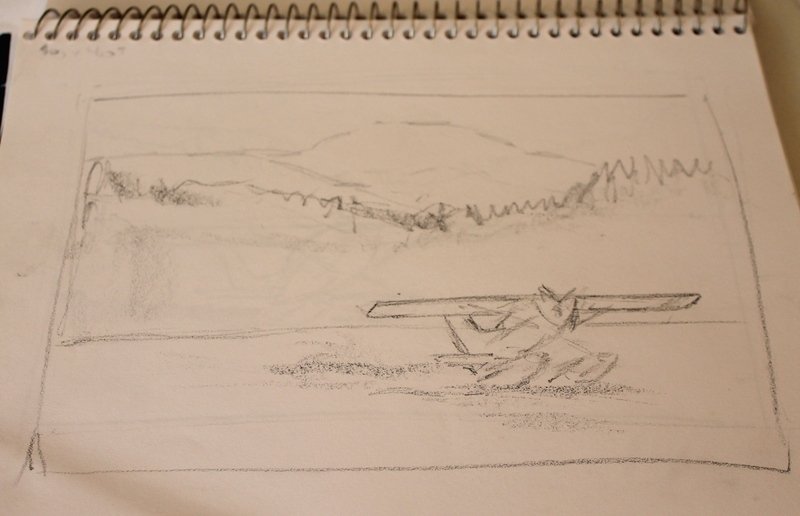 I did a number of sketches and we agreed on the composition. The size of the canvas was chosen to fit the space above the fireplace mantle in his home. 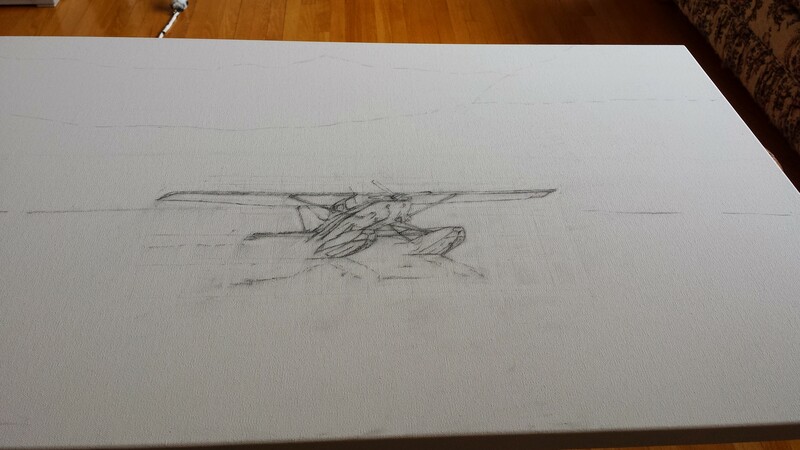 Once the composition was determined then I started the drawing on the canvas. 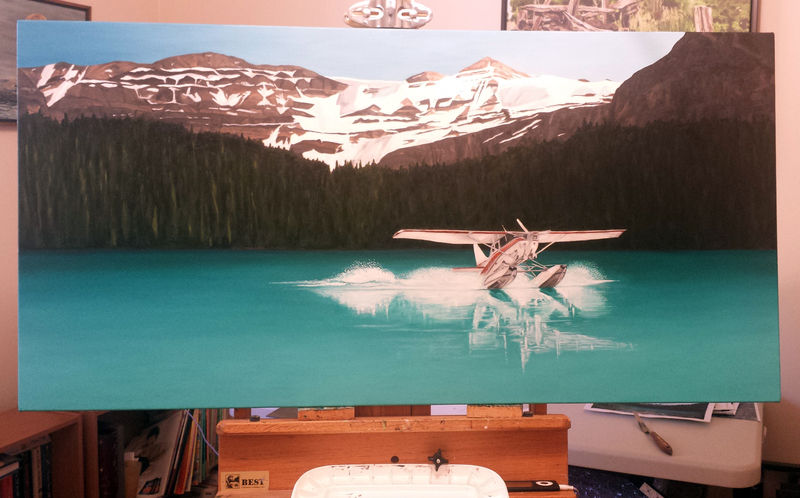 I wanted to make sure I had the detail of the plane right as it is the focal point of the painting. With the first layer of paint that goes onto the canvas I try to get an idea for colours and concentrate on the darks and lights. I’m not worried about detail at this point. 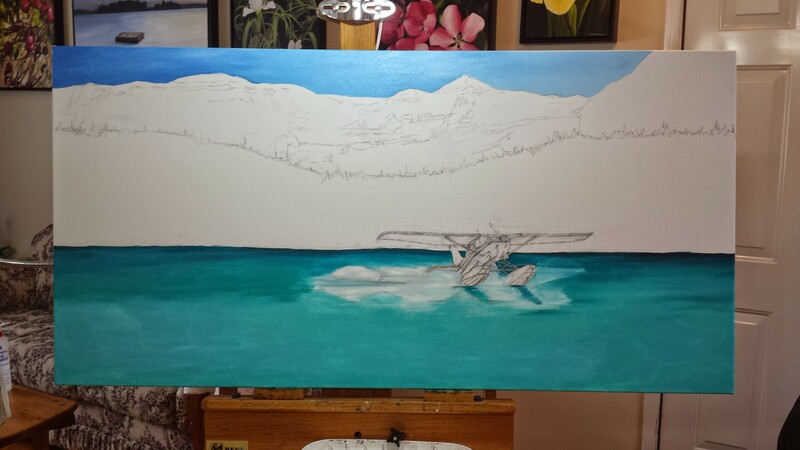 With the second layer (and third) I add definition to the edges, deepen the contrasts and add intensity to the colours. 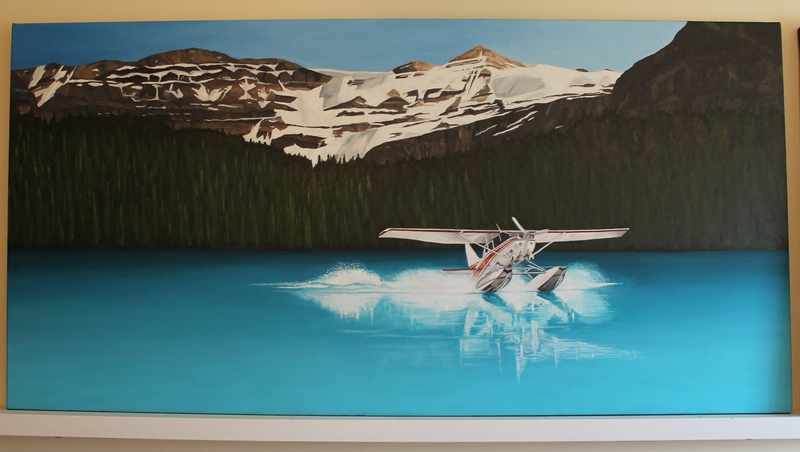 And finally, after many months (another late ‘flair’ if you will) the painting is complete and ready for its new home! I hope you enjoy it Rob & Karen! 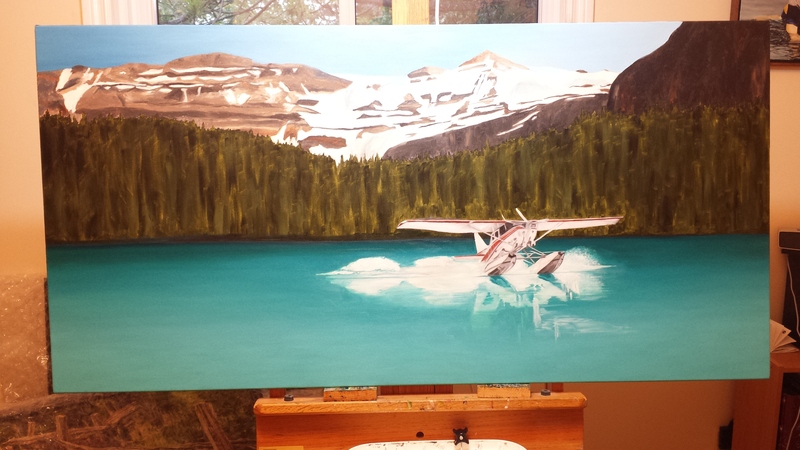 This entry was posted in Art and tagged airplane, art, commission, float plane, glacial lake, Late Flare, mountains, oil painting, painting, pilot on November 1, 2015 by bl.stonehouse@gmail.com. 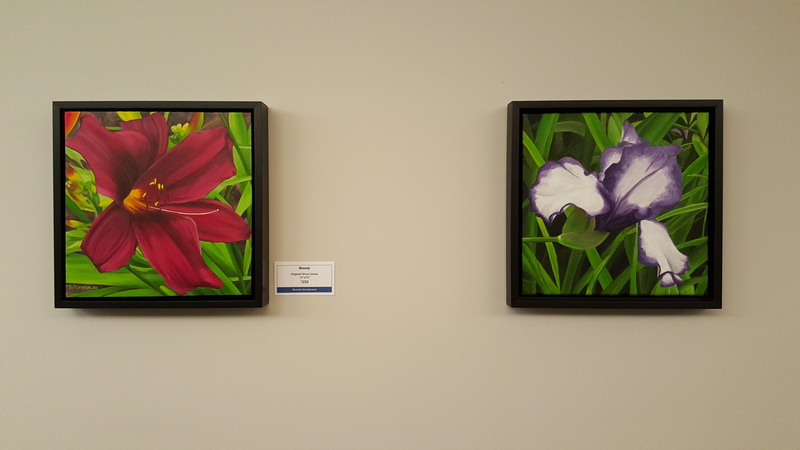 My paintings are currently on display at Kawartha Lakes City Hall at 26 Francis St. in Lindsay. It’s beautiful Victorian architecture is a beautiful backdrop for a gallery! 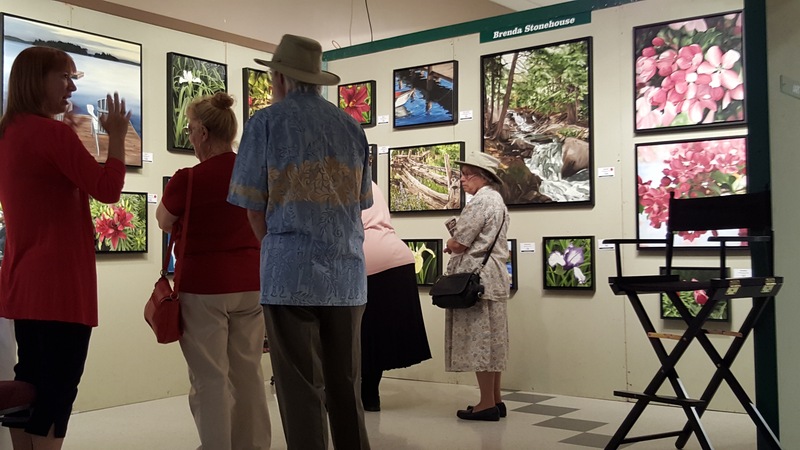 The Mayor has provided the opportunity for local artists to exhibit their work each month. It’s great to have another venue to promote and share our artwork in our community. 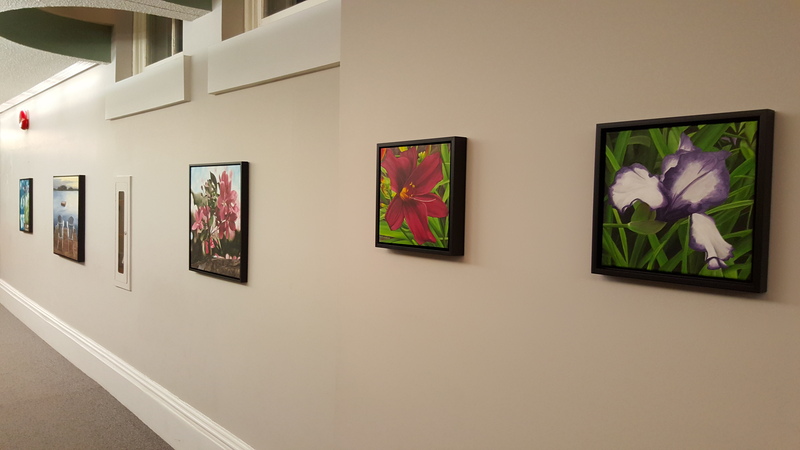 City Hall is open to the public Monday to Friday 8:30am – 4:30pm and my paintings will be up until November 13. Stop by and take a look! 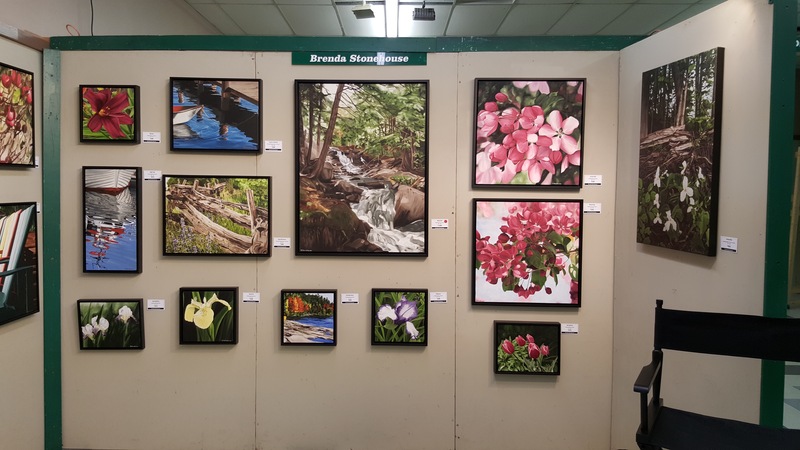 This entry was posted in Art and tagged art, City Hall, display, exhibition, gallery, Kawartha Lakes, oil painting, painting, venue on October 18, 2015 by bl.stonehouse@gmail.com. This fall I decided to renew my focus in my art business and I enrolled in an Art Biz bootcamp. It’s designed with weekly online modules that take you through the different aspects of marketing your art business. One of the first tasks of the course was to commit to making art. It’s simple really….you need to create art so you have a body of work to market and sell. Over the past couple of years I have let my creative time go by, just painting here and there when I could fit it in. Other things seemed to take priority and it was easy to say ‘I’ll paint later’. Unfortunately ‘later’ doesn’t always come. willing to take the time I need for it. It keeps me accountable and productive and stops me from making excuses! I didn’t realize how much I had missed painting regularly until I got back into it. It’s amazing how much momentum you get when you work at something consistently. I’ll will be getting back to blogging on a more regular schedule too so I can share my work with you! 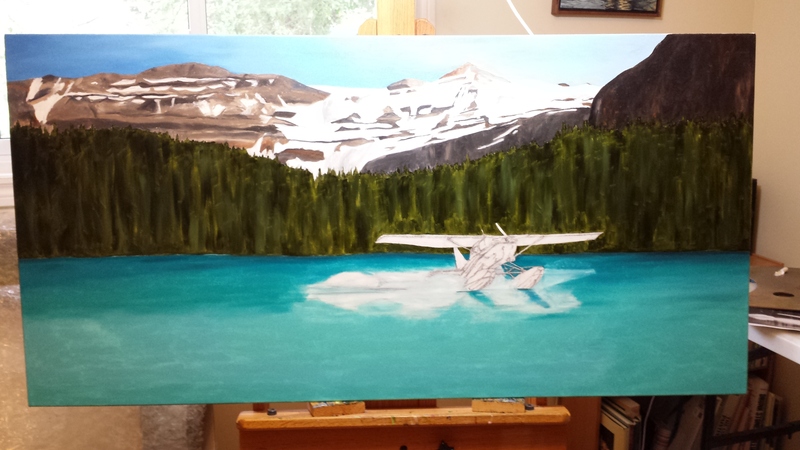 This entry was posted in Art and tagged accountability, art, Art Biz bootcamp, focus, painting, studio, studio hours on October 5, 2015 by bl.stonehouse@gmail.com.